It was Hendrik 'b0nd' von Eye in round two, who delisted himself from the favourites with an unlucky crash. But there is still hope for SK Gaming in the ESL LFS Pre-Season. Round three and at the same time the final round, will take place in Aston tonight. Sebastian 'ClioRacer' Seybold showed another stable performance in Fern Bay Black one week ago. Though it was Johannes 'zockmachine' Scheuerle from #low-racing who took home all the glory again. He already set the pace during the entire pre-season with the fastest qualifying laps and victories in four of four heats so far. Therefore he is rightly the championship leader and odds-on favourite. Second overall is still Markus 'Checkout' Gunzelmann followed by mentioned SK Gaming's Sebastian 'ClioRacer' Seybold. All of them still have theoretical chances to win the cup. And it is showtime tonight on Aston Grand Touring with the four-wheel-drive FXO GTR. 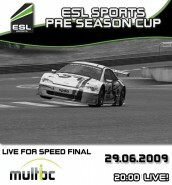 You can watch the final race on SK Gaming thanks to MultiBC. The show starts 20:00 CET and kicks off with a qualifying session followed by two half an hour races before the champion will be crowned, whether it is going to be Johannes 'zockmachine' Scheuerle, Sebastian 'ClioRacer' Seybold or somebody else.